Global Distribution Panel Market size for 2016 was valued over USD 4.5 Billion and is set to witness gain over 5% by 2024. Rising installation of energy efficient electrical systems to get sustainable power output will upsurge the distribution panel market size. Various labels and energy performance standards are introduced by the regulators to effectively monitor their energy consumption. As of now, more than 80 countries have defined their own energy efficiency standards & labels. In addition, manufacturers are focussing toward the development of innovative systems such as smart panels to comply with the defined standards. Increasing funding toward the electrification across remote areas of developing regions will positively influence the distribution board market share. Rising investments from financial institutions including Regional development banks, International Finance Corporation Asian Development Bank and African Development Bank, will further foster the business landscape. Effective power supply escorted by concerns pertaining to circuit safety is anticipated to fuel the industry demand. Regulators aim to reduce distribution losses by adopting high end electric equipment will further stimulate the business growth. Low voltage distribution panel market in 2016, was valued over USD 600 million. Growing concentration of residential premises across urban areas will stimulate the product demand. In addition, several rural electrification schemes run by various state and central authorities will further escalate the industry revenue. 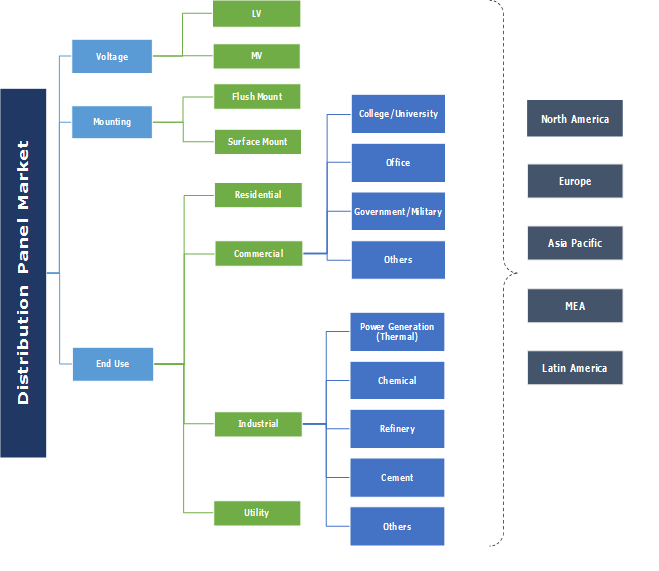 Medium voltage distribution board market is projected to witness strong growth on account of increasing investments toward the development of new commercial and industrial facilities. Government measures to expand the existing manufacturing capability in order to reduce the import dependency will further add to the industry revenue. Flush mounting distribution board market is set to expand over 5% by 2024. Less space requirement along with high safety index are some of the key underlined features which will encourage the product penetration across commercial facilities. Surface mounting distribution panel market is anticipated to gain a significant momentum due to rapid increase in the concentration of industrial manufacturing facilities. High reliability index coupled with improvised efficiency level when installed in poured concrete wall will boost the product demand across industrial facilities. Flourishing real estate industry coupled with extensively growing urban population will boost the residential distribution board market. Over the past decade increasing urbanization has significantly raise the funding in the residential real estate industry. According to world health organization in 2014, urban population accounted for over 51% of the total global population. Utility in 2016, accounted for over 40% of the global market share. Concerns toward the distribution of reliable power supply will further complement the business outlook. In addition, growing investments toward the replacement of aging power distribution infrastructure will positively impact the industry growth. The U.S. distribution panel market in 2016, was valued over USD 1 billion. The country capital expenditure for electric and gas utility soared significantly from USD 69 billion in 2008 to USD 115 billion in 2015. Government initiatives to replace the existing aging distribution network with the efficient, cost effective and smart systems will stimulate the product penetration. UK market is anticipated to witness strong growth on account of increasing demand for efficient electric equipment. The Government of UK has set up National Infrastructure Commission which is working on the formulation of long term strategy in order to upgrade the country’s aging infrastructure to accommodate the up-surging population. Over the coming years Brexit vote will create strong economic impact in the country’s real estate sector including residential and commercial which will positively boost the product demand. Government favorable measures to supply reliable and continuous power supply to end consumers will foster the Asia Pacific market. The Government of India in 2015, launched Deen Dayal Upadhyaya Gram Jyoti Yojana to facilitate continuous power supply to rural households. Over the coming years rising investments across the automobile and electronic industry primarily in the South Asian countries will stimulate the product adoption. Key participants in the industry include Legrand, Eaton, Hager, GE, Siemens, NHP Electrical Engineering Products, ABB, Larsen & Toubro, Industrial Electric Mfg, ESL Power Systems, Schneider Electric, Arabian Gulf Switchgear, and Abunayyan Holding. The industry has witness significant growth over the last decade due to growing urban population leading to high electricity demand. Notable players are focusing more towards development of new organic expansion strategies to expand their global penetration. A distribution board is a component for power supply system which splits an electrical energy feed into secondary circuits, while serving as a protecting fuse for respective circuit in a common enclosure. It comprises of one main breaker and other variety of circuit breakers which trips off the power supply during fluctuations.